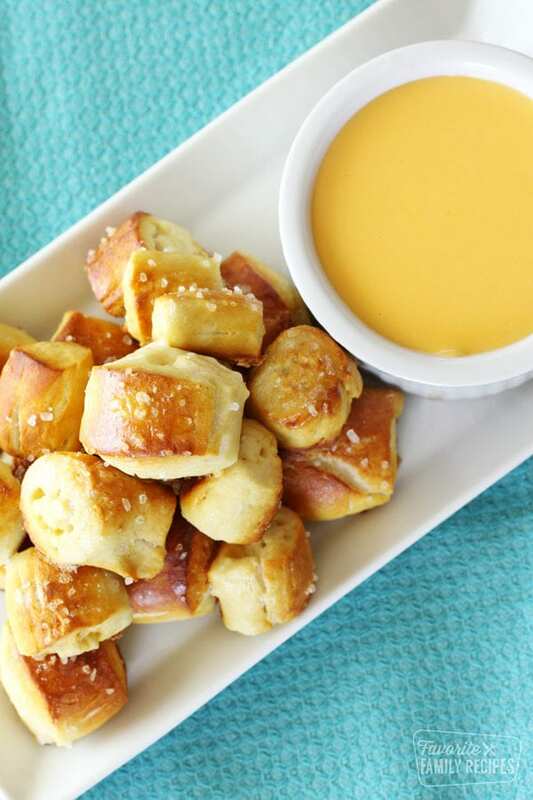 This cheddar cheese sauce is creamy, smooth, and SO easy to make. Goes great with nachos, pretzels, steamed vegetables, fries and MORE! 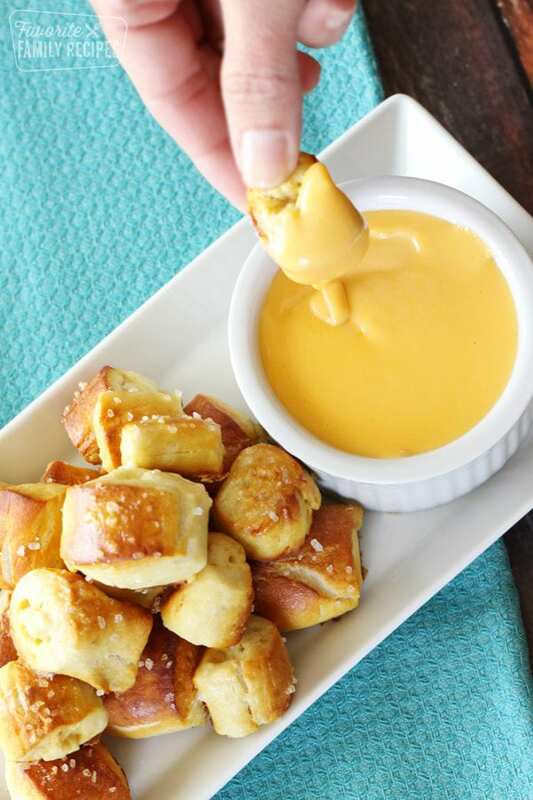 My favorite thing to dip in cheese sauce is soft pretzels. YUM! 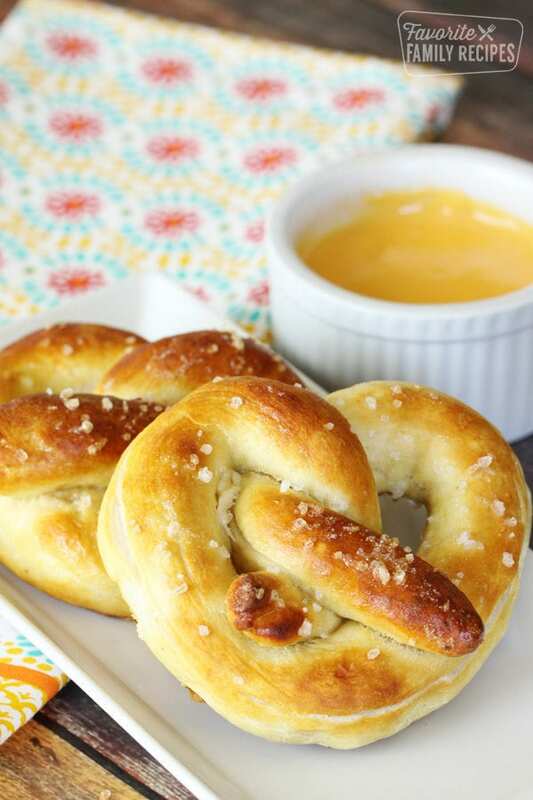 We have a great recipe HERE for soft pretzels. You can also dip fries, potato wedges, or steamed vegetables. You will love it on broccoli or cauliflower! Can I use other cheese besides cheddar? Absolutely! In fact, having a blend of different cheeses is a great way to go! You can use any combination of Mozzarella, Cheddar Jack, Pepper Jack, Monterey Jack, or any kind of cheddar. I usually always go for the extra sharp cheese but I love mixing it with Pepper Jack. Which leads me to..
To make nacho cheese sauce, just swap out half of the cheddar cheese in this recipe for Pepper Jack. Follow the recipe as written and then at the end, add a couple tsp. of hot sauce (like Frank’s Hot Sauce, Tapatio, Valentina’s etc..) and a tsp. or two of finely diced jalapeño. For the jalapeño, I always use the kind in the can or jar because fresh will add a crunch to your cheese dip that you may not want. Why does cheese sauce get grainy or gritty? 9 times out of 10 cheese sauce gets grainy because it has either melted too FAST or has been OVERHEATED. There is definitely a sweet spot when it comes to cheese. You want your cheese to heat up slooowwwwllyy. It may seem like it is taking forever but it will be worth it. Once it is melted and where you want it to be, reduce the heat even more so you can keep it right where you want it. If you continue to heat it the proteins will separate and it may start to get lumpy and gritty. Why is my cheese sauce bland? That’s on the cheese. I like to use EXTRA sharp cheddar when making cheese sauce because I love the flavor. 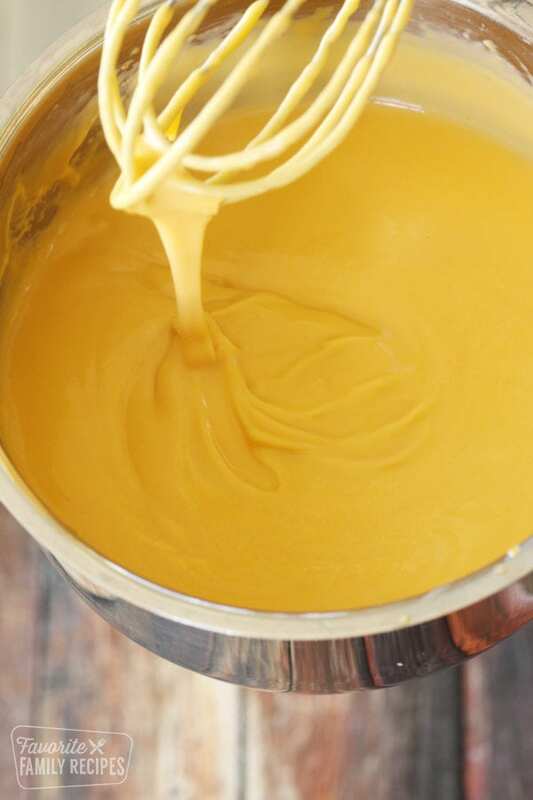 Your cheese sauce will ultimately end up tasting like the cheese that you use, because that is exactly what it is. If you use milk cheddar cheese, you aren’t going to get a rich, cheesy flavor. The dry mustard in this recipe helps to enhance that flavor but don’t overdo it on the mustard. Still want more flavor? Try adding some hot sauce, jalapeños, or worcestershire sauce. Is cheese sauce gluten free? YES! This recipe for cheese sauce has NO flour in it. It is completely GF. Other recipes I have seen have you toss the cheese in flour but because we use cornstarch in this recipe is is gluten-free. In a word? No. 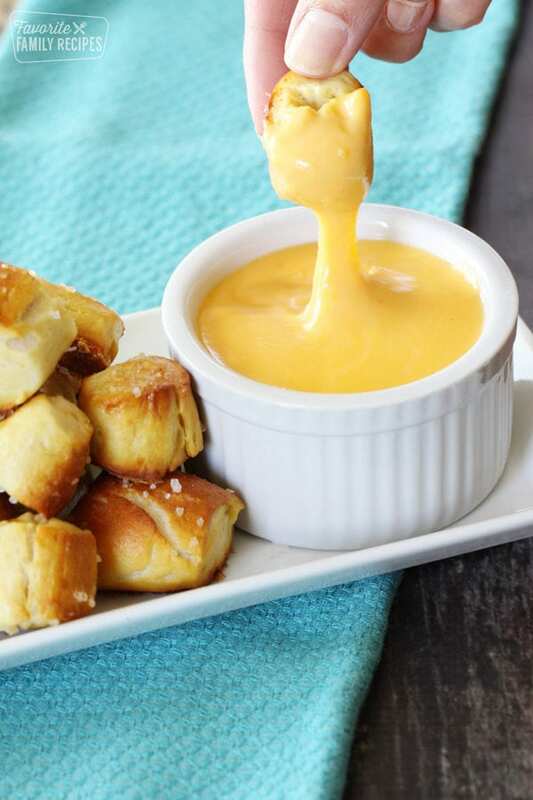 Try to make as much cheese sauce as you think you will need in one sitting. Typically when the cheese cools and is re-heated it will turn out gritty. You can try heating it again over the stove over very low heat but we have never had success doing this without it getting grainy. In a large bowl, toss shredded cheese and cornstarch, shaking off any excess cornstarch (hand-shredded cheese works best, try to avoid pre-packaged shredded cheeses). Place cheese in a medium-sized sauce pan. Add HALF of the evaporated milk and 1 tsp of dry mustard. Heat over low heat, stirring CONSTANTLY until cheese melts, adding more evaporated milk when needed to reach desired consistency (we usually end up using all of the evaporated milk). The mixture will seem grainy as it starts melting but keep at it. The graininess will go away as it heats and the cheese will become nice and smooth. Once cheese has melted, add cream cheese and stir until smooth and mixed in. Serve immediately. If serving for a group or party, keep warm in a small slow cooker on low heat to keep from getting clumpy. Stir often.